In the face of a correction in Toronto’s housing market, sellers aren’t panicking. Even with transactions at their lowest level since the 2009 recession, sellers in Canada’s largest city have avoided listing their homes en masse in what could be a sign of confidence the market will come back. According to data released Tuesday by the Canadian Real Estate Association, new listings in Toronto fell 8.6 per cent in April from a month earlier and are down nearly 30 per cent from a year ago. 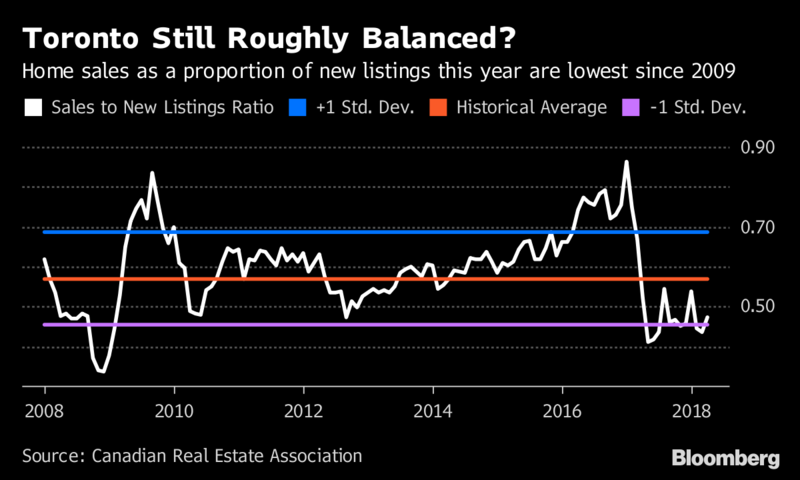 The drop has left the sales-to-listings ratio -- a key gauge of a real estate market’s health -- relatively stable in the face of a sharp drop in sales, which may explain why prices in Toronto continue to hold steady. Prices are up 3.1 per cent since the beginning of 2018, even as transactions plunged. It’s still been a rough year for Toronto’s realtors, after federal regulators tightened mortgage qualification rules on Jan. 1 to quell a surge in prices early last year. The market is also facing a new foreign buyers tax and other measures to curb demand. Toronto’s real estate market is also coping with a bulk of unsold active listings, a legacy of last year’s surge in prices that prompted people rushed to sell their homes. The sales-to-new-listings ratio, while stabilized, is still at the lower end of the range over the past decade. The ratio has averaged 0.46 over the last year, the lowest level since the recession and at the lower-end of what analysts typically consider a balanced market. But at least, it hasn’t been getting any worse. Year to date, sales have fallen by a third compared to the start of 2017. New listings are down just 4.7 per cent over the same period.